Colts Neck, New Jersey was a rural farming and horse breeding community, connected to the Monmouth County seat of Freehold by an old farm road, which is now Route 537. Delicious Orchards grew to 110 acres over the years after the orchard opened in 1911, with three generations of the Barclay family managing the operation. 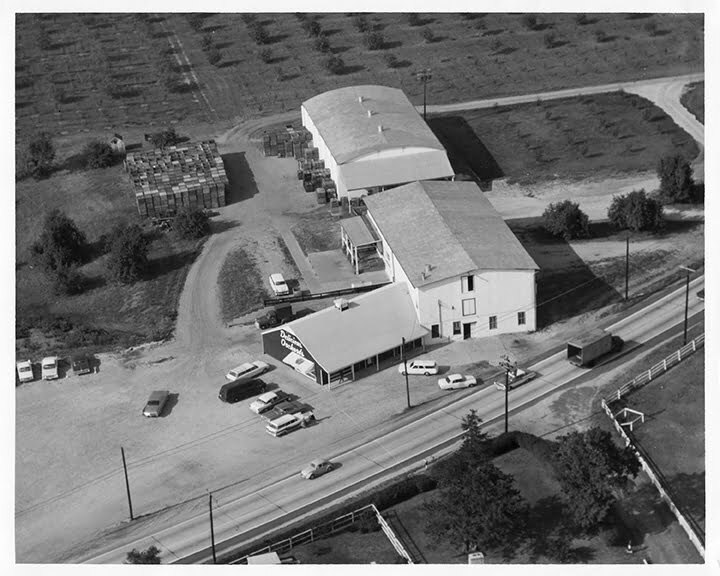 Carroll W. Barclay took over the operation of Delicious Orchards after World War II and began to change the operations from strictly wholesale to a mix of retail. In 1959, Barclay hauled several wagonloads of apples to the roadside and set up a makeshift stand. This success with the public led to the construction of a 1,200 square foot stand the following year, and the modern day Delicious Orchards was born. Barclay catered to the needs of the public, expanding the product lines to include fresh apple cider and his wife Janet’s apple pie (whose recipe we still use today). And the apples! Jonathans, McIntosh, Rome Beauty, Winesap and Red Delicious were all grown at Delicious Orchards and hand-picked for the best flavor at their peak season. 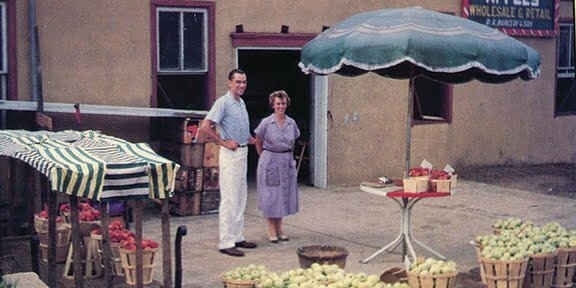 As the Delicious Orchards name became more famous in the 1960s, the Barclays moved toward a year-round business with the addition of more produce and baked goods. Janet Barclay lost her living and dining rooms to the bakery operation, adding blueberry, cherry, strawberry-rhubarb, peach and pumpkin to the apple favorites. By 1965, Janet Barclay and her crew of local ladies and helpers were baking 3,000 pies per week. In 1966, the Barclays bought a red brick building on Route 34 at Delicious Orchards current home. Now, with operations indoors, citrus fruits were added as well as cheeses. Three additions in 1969, 1972 and 1982 more than doubled the size of Delicious Orchards. Along the way, the Barclays brought in his sister Carolyn and her husband Bill Smith. Through the 1970s the Delicious Orchards name spread throughout New Jersey and beyond. Shore visitors added a trip to Delicious Orchards to their itinerary. The bakery grew to include cookies, donuts, and custom cakes. Over 150 cheeses and 85 varieties of coffee and tea and a full line of grocery items and candy complemented the fresh produce, with gift baskets and mail order bringing the goodness of Delicious Orchards across the country. During the fall of 1977, the Barclays and the Smiths decided to leave the day to day operations of Delicious Orchards, and over the years sold their ownership to their management team, Tom Gesualdo, Bill McDonald and Frank McMahon. But the same attention to quality and customer service has prevailed. Courtesy, knowledge and friendliness is not just a motto it is the only way Delicious Orchards will do business. In 2001 and 2008 Frank McMahon and Tom Gesualdo retired from Delicious Orchards. Bill McDonald and his family are now the owners and operators of Delicious Orchards. Bill and his wife Linda have four children who are all active in the family business. Keri, Chris, Mike and Erin all have a passion for the family business and their father has raised them to understand and embrace the values that Delicious Orchards stands for. Over 2.5 million people visit Delicious Orchards during the year. We want each visitor to have a pleasant experience and tell their friends. We will continue to be committed to our customers’ convenience and comfort with every visit to Delicious Orchards enjoyable. We feel we’re still of the same philosophy John Barclay had when the first apple tree was planted 100 years ago. Uncompromising quality and making the customer number one. Each of our 250 employees is committed to excellence. Over 3,000 vendors know that to sell to Delicious Orchards is to sell only the best. From each of us here at Delicious Orchards thank you for the past 100 years and we look forward to 100 more!